Hearthstone is one of the most addicting and fun games to play on this planet. The thing is though when you first get into the game you are totally hyped. You love all the cool looking cards and run through the tutorial. Finally, you jump into a game with a real person with a deck full of basic cards and..SMOOSH!! Then it happens again, and again, and…again. You jump into Arena the first time and you go 0-3 and feel like it is time to just quit playing. You wonder how so many people love this stupid game. Well friends, I have some advice to help all you n00bs that really want to play but feel like there is no hope at all. Rome wasn’t built in a day and neither will your card collection. Patience is something that all new players need. It isn’t possible to just jump right into the game and start playing like the next Reynad or Trump. It’s just not going to happen. Just understand that you will lose some and win some. Hearthstone isn’t any different than any other game in the world. It takes time to build up your card collection and time to become a better player. So just slow down and know that all this early card collecting and losing will help you become a better player in the long run. It is real easy early on to want to spend your gold on packs. Most experts and beautiful geniuses like me will tell you that isn’t the way to go. Arena, no matter how bad you are and trust me I stink at it, is the smart way economically to grab packs, gold, etc. The reason is you get more bang for your buck. Just the other day I went into an Arena. I dropped the 150 gold ready to make my long run to 12 wins. Well, I went 1-3 instead. For that win record, I got a pack of cards and 30 gold. I was able to stretch my gold a little farther by playing Arena, no matter how bad I stunk up the place. Daily quests are your friend. They are the best way to chuck a little gold out every day no matter what. They will, usually, earn you a ticket to Arena every day and that will help you build your collection and make you a better player overall in the end. 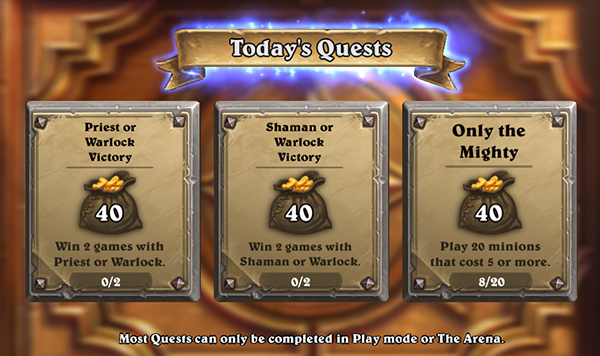 Quick Tip: Tavern Brawl, when it is open, is always the best way to do daily quests. The reason is many times you aren’t using one of your smoosh decks. It will help you finish your quests a little faster and that means a little less time grinding. Watching streamers is an invaluable asset because it helps you see some of the best players in the world play the game and commentate over what they are doing. It will give insight on the best way to handle certain situations. Sometimes, it can also show you what not to do. No one is perfect, ask Pavel (go Google “European Hearthstone misplay” to get this reference), but it is our mistakes in the game that make us better if we learn from them. 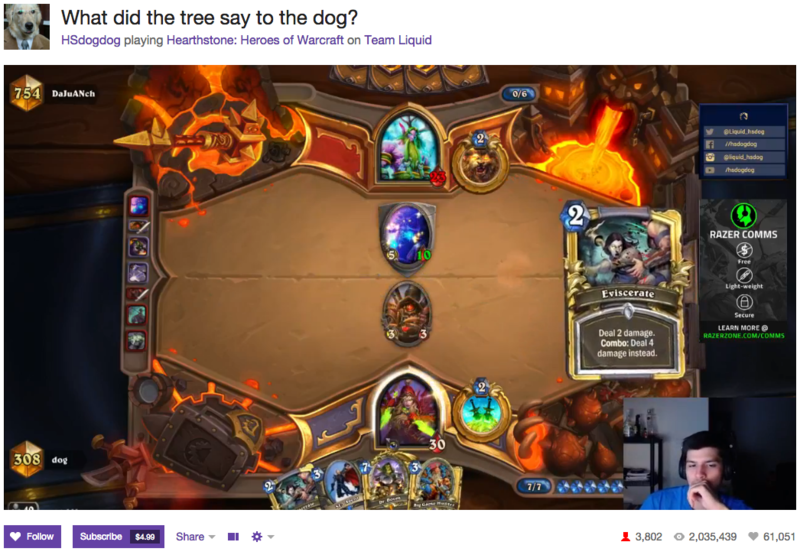 Streamers on Twitch, or wherever you want to watch, is the best live resource on the market. Also websites, just like this one, is chocked full of great articles and resources. If you are serious about getting better, spend some time doing that thing that is a lost art nowadays, reading. Trust me, it will make you better and help you learn the great art of deck building..or at least being able to use the more popular ones. Hearthstone is still just a game and you should have fun playing it. Don’t take things to seriously and just have fun playing this goofy little game that we all spend way too much time playing. Have fun in the wins and the losses. Laugh at your mistakes and cheer at your wins. Just have a good time and be nice to those you play against. Also, don’t give up playing just because you are losing a lot early on. It can be frustrating but just stay with it and remember winning isn’t everything. Just know that the more you play, the better you will get. The cards will come over time. Stick with it and everything will be where you want it to end up. Extra Tip: Be smart with your Dust. I know it is very tempting to go and get rid of one card but understand that at some point the meta may change and you might need that card again. As my mom used to tell me, “Don’t let your eyes get bigger than your stomach”. Hearthstone is a great and fun game but can be a bit of a beat down early on. Yes, you can totally go and spend money on cards to speed up the process a little but if you are like some of us who have had three divorces (j/k) and have one big mouth to feed you have to lean a little less away from the wallet. Just know that better cards doesn’t really make you a better player. It just makes you a new player with better cards. Whichever way you want to go though, just hang in there. The more you play the better you will become at the game. Rome wasn’t built in a day and neither will your game skills or card collection.